The Toolik Field Station (TFS) belongs to the Institute of ArcticDefinitions of the Arctic vary according to environmental, geographical, political, cultural and scientific perspectives. Some scientists define the Arctic as areas having a high latitude, long winters, short, cool summers,... More BiologyThe study of life and living organisms (from the Greek word 'bios' meaning life).... More of the University of Alaska Fairbanks. TFS is located 210 km south of Deadhorse and 600 km north of Fairbanks in arctic Alaska. The field station is situated north of Gates of the Arctic National Park, and its location allows scientists to access the Brooks Range, the arctic foothills and the arctic coastal plain. TFS is situated in the arctic foothills province of the North Slope, which is characterised by rolling hills and broad valleys underlain by continuous permafrostPermafrost is frozen ground that remains at or below zero degrees Celsius (32 degrees Fahrenheit) for two or more years. It forms in regions where the mean annual temperature is... More. The area is dotted with lakes, and the vegetation is dominated by dwarf-shrub and tussock tundraA type of ecosystem in which tree growth is limited by low temperatures. The origin of the word is from from the Kildin Sami word tūndâr, meaning "uplands" or "treeless mountain tract". In the northern... More. Caribou and Arctic ground squirrels are frequently observed at the field station, and moose, musk-oxen and grizzly bears are encountered occasionally. TFS was first established in 1975 to support an aquatic research program. The field station evolved from a 10-person tent camp into a premier arctic research laboratory and science support facility capable of supporting up to 150 researchers. The field station includes several laboratory trailers and tents, a lecture hall, various dormitory accommodation styles, a kitchen and dining hall, shower and laundry facilities, and a tool shop. TFS is open year-round and provides transportation to and from the station, basic science support, high-speed internet, GIS services, general use laboratory and field equipment, herbarium, and baseline environmental and meteorological data. Research themes at TFS are wide-ranging and dynamic and currently include the structure and function of terrestrial and aquatic ecosystems of the arctic foothills and tundra, the effects of Climate ChangeAccording to the United Nations Framework Convention on Climate Change, climate change is change in the climate of the whole Earth or a region of the Earth that is believed... More in these regions and the feedbacks to global ClimateThe average weather we would expect over a long period of time (seasons, years, decades). Climate varies from place-to-place across the Earth. Climate is determined by long-term (over at least... More Change through gas and hydrological fluxes. TFS-based research has also led to significant discoveries on the adaptations of plants and animals to the Arctic and to population-level changes in phenologies and distributions. Existing databases hosted at TFS include climate records and baseline environmental monitoring. A substantial body of research data collected by the arctic LTER program are also available from their website. TFS is located in the North Slope Borough of northern Alaska close to the Dalton High-way. 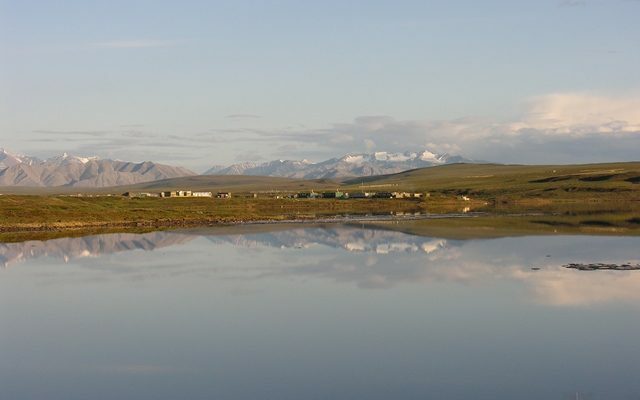 Anaktuvuk is the closest native village, which is situated in the Brooks Range about 150 km west of TFS by air. TFS is accessible by road from Deadhorse and Fairbanks. The field station provides transportation to and from these towns, and snowmobiles, boats, trucks, and bicycles are available for local transportation. A helicopter scheduled through the National Science Foundation is based at TFS.